Home NexOptic (OTCQX: NXOPF) Is Disrupting An $80 Billion Market, Early Investors Could Make A Fortune. NexOptic (OTCQX: NXOPF) Is Disrupting An $80 Billion Market, Early Investors Could Make A Fortune. Could This Be The Next Billion Dollar Tech Darling? Turnaround specialist and Former CEO of Lexmark just joined NexOptic (OTCQX: NXOPF, TSX-V: NXO) board of directors. Board of directors also includes former Chief Technologist of NASA. Market capitalization of less than $70 million. Preparing to launch it's first multi-award-winning next gen consumer product globally this year. NexOptic Technology Corp (OTCQX: NXOPF, TSX Venture: NXO) engineers remarkably disruptive optical technologies, including smartphone lenses that blow away the competition. They have also created an artificial intelligence that turns nighttime into daylight and could soon see it become standard in every single camera system in the world (from automobiles to smartphones to DSLR’s to…) and they’re about to launch their own rugged, multi-award-winning digitized binocular that puts the power of a telescope neatly into the palm of your hand. Believe me I say, when you see their re-imagined binoculars, you’ll want one, as will millions of others when they hit stores later this year. Led by a world class management team that includes the former Chief Technologist of NASA, NexOptic's technologies could transform an entire $80 billion-dollar industry and lead to the creation of entirely new sectors. When NexOptic hits the global stage and makes headlines later this year, it's shares may well be trading 500% - 1000% higher and quite possibly make a move to the big board on the Nasdaq. I believe this is a rare opportunity to participate in what many feel could become the next world standard in photography, video and imaging. Here are the top 5 reasons to consider NexOptic right now. NexOptic (OTCQX: NXOPF, TSX-V: NXO) market capitalization of $70 million (USD) compared to FitBit (NYSE: FIT) at $1.2 billion and GoPro (Nasdaq: GPRO) at $750 million. Their Board of Directors now includes famed turnaround specialist & successful CEO of Lexmark, Rich Geruson as well as NASA’s Former Chief Technologist of 12 years, Bobby Braun. Their technologies integrate A.I. into revolutionary next generation camera lenses including smartphones and consumer products, bending the rules in the rapidly growing $80 Billion optics industry. They have developed Artificial Intelligence for virtually all camera lens systems that is so remarkable it leaves the competition in darkness, quite literally and their AI alone could be worth over $1 Billion annually in revenues to the Company. Chosen from literally thousands of amazing new products and technologies, NexOptic's "DoubleTake" has already brought home two prestigious awards this year. Top Award Winner at CES 2019, and "Best in Show" by GearJunkie, at North America's largest outdoor trade show. NexOptic's AI can turn virtually any camera into a night vision marvel, even smartphone cameras. The automobile industry has been dreaming about a technology like this because it can make every car on the road much safer including autonomous vehicles. What do you suppose this will do to the smartphone and automotive industries once NexOptic unleashes their technology into the mainstream? Along with the design firm behind FitBit, NexOptic has also re-imagined what binoculars will look and feel like in the very near future with their multiple award winning DoubleTake™, targeted for global sales this year and could in fact outsell all of GoPro’s current product lineup. DoubleTake has already taken home two prestigious awards this year! They were the Top Award Winner in Photography at the world's largest technology show, CES 2019; and GearJunkie has awarded them the "Best In Show" Winter Gear 2019 at the Outdoor Retailer Snow Show - North America's largest outdoor trade show. Many already believe this product will be a GoPro killer and take over outdoor and sporting photography and video. To top it off, their smartphone lens designs already outperform the best of the competition and continue to get better. This could become the next standard in smartphone camera's, adding potentially billions more to top line sales. Early investors of FitBit (Nasdaq: FIT) saw their shares skyrocket over 100,000%. FitBit's designers are working with NexOptic Technology Corp (OTCQX: NXOPF, TSX-V: NXO) as the company prepares for it's first mass market product launch. We could be looking at a once in a generation investment opportunity in NexOptic as they work toward rolling out a disruptive suite of optical technologies, including unprecedented A.I. photography and imaging for smartphone camera's. 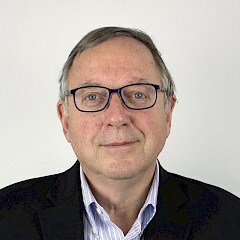 Dr. Robert Braun, Former Chief Technologist of NASA (12 years) and still an advisor to NASA, as well as Dean of Engineering and Applied Sciences at CU Boulder, a university that receives more funding from NASA than any other university in the world. 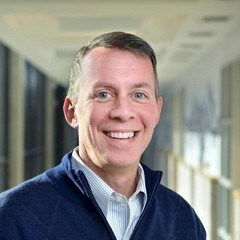 Arch Meredith, Managing Partner of Kite Hill Capital, his private venture capital firm, which has been a pre-IPO and early investor in various companies in the technology sector, including, among others, Tesla Inc (Nasdaq: TSLA). 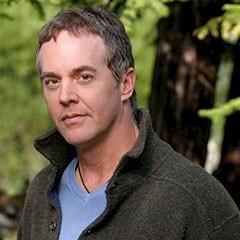 and Uber Technologies Inc.
Stephen Petranek, renowned technology futurist and author of the critically acclaimed “How We’ll Live On Mars” which was partly a result of his extensive conversations and interviews with Elon Musk, CEO of Space-X, and senior management and leading scientists at NASA. In this brief summary I'll explain why I believe shares of NexOptic (OTCQX: NXOPF) present a ground floor opportunity with blue sky potential, as the company enters the next level of its remarkable evolution. It’s felt by some that we are already looking at a new gold standard in artificial intelligence excellence that will impact virtually every single camera to come. NexOptic's A.I. technologies turn photographing or videoing in conditions otherwise too dark or too bright, into “perfect” conditions for image capture. The advantages to this are immense for the entire security camera industry, the entire smartphone industry and the entire automobile industry among many others. The optics market grows at 20% per year and for good reason; we each have more cameras and lenses in our phones, laptops and cars than ever before. In fact cameras are everywhere, you literally can’t escape them. The reality is, every time you enter a bank, a store or shopping mall or even a busy street corner, there’s a good chance that a whole bunch of lens systems are capturing your every move. And an infinite number of these cameras can be using NexOptic’s AI and/or engineered lenses starting in the very near future. NexOptic’s AI will allow cameras to be built smaller and cheaper while offering far superior images in all kinds of lighting conditions, day or night. The industries that their artificial intelligence alone might impact is endless as I’ve already mentioned, but there’s so much more to this company than just their revolutionary AI. At the heart of this Company’s lens technologies is their patented and patent pending BladeOptics™ systems, which in some instances, contain flat surfaces with square apertures – a revolutionary upgrade over today’s conventional curved, round lens systems – a basic premise has not changed much in over 300 years; until now. Their recent breakthroughs in engineered lens technology designs for smartphone camera’s, binoculars and telescopes are also proven and this year they plan to turn the entire global binocular and sports photography/video industry on its head with DoubleTake™, their remarkable award-winning digital binocular that has everyone talking. DoubleTake™ alone has the potential to launch this company into billion dollar plus market cap territory. Designed collaboratively with the creators of FitBit, it’s felt by many that this product could not only dominate the entire global sport optics industry, but it could make the industry itself even bigger than it already is. Easier to use than a GoPro, its design is remarkably rugged plus it’s weatherproof. It can sure take a beating, while snapping incredibly high res photos and video on the fly - including an instant 10x zoom button all in a unprecedented compact size for its zooming power. It equally appeals to weekenders with kids, sport fans and concert goers heading to the stadium as it does with rugged back country climbers and hikers on epic expeditions into parts unknown. And it weighs less than a DSLR camera zoom lens. DoubleTake™ will let you see further than anyone has seen before from a device as compact and as easily portable as it is. And it isn’t just a binocular. It will also capture remarkable images and video - A must take along for your next trip oversees, across the state or just to the local park. It hits store shelves later this year and we think that it might be able to start outselling all of GoPro’s offerings in short order. We feel this is just the beginning of an incredible ascent the company is about to embark on. 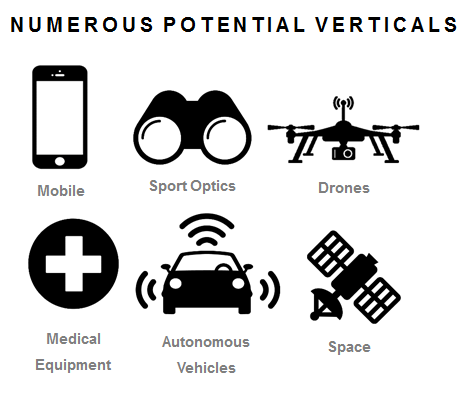 Security, healthcare, drones, satellites are just a few industry's NexOptic is looking to penetrate and perhaps even dominate. Here’s what NASA’s former Chief Technologist (12 years) had to say when he joined NexOptic’s Board of Directors last year. A Once in a Generation Opportunity For Investors? Greater resolution, over greater distance, in smaller devices. The potential for introducing this technology, housed in world class design, into the marketplace is simply staggering. Early investors in FitBit saw the value of their shares skyrocket over 100,000%. These companies came to be worth billions of dollars by incorporating existing technologies into new, slick designs. Gadi Amit’s NewDealDesign, designers of FitBit’s wearable devices, and NexOptic are working together on changing the way we take pictures and view our world. NexOptic is evolving from a proof-of-concept company to a potential full-blown, industry-leading, innovative optical development company. They’ve assembled a team of internationally recognized leaders who understand the possibilities of this technology, and are capable of realizing the incredible value potential for shareholders. If you’re looking for a ground floor investment moving into the next chapter of their evolution, we’re suggesting you visit the NexOptic website and check it out for yourself. Nothing in this publication should be considered as personalized financial advice. We are not licensed under any securities laws to address your particular financial situation. No communication by our employees to you should be deemed as personalized financial advice. Please consult a licensed financial advisor before making any investment decision. This is a paid advertisement and is neither an offer nor recommendation to buy or sell any security. We hold no investment licenses and are thus neither licensed nor qualified to provide investment advice. The content in this report or email is not provided to any individual with a view toward their individual circumstances. MicrocapStockwire.com is a website owned by Mountain Capital Corp (“Mountain”). 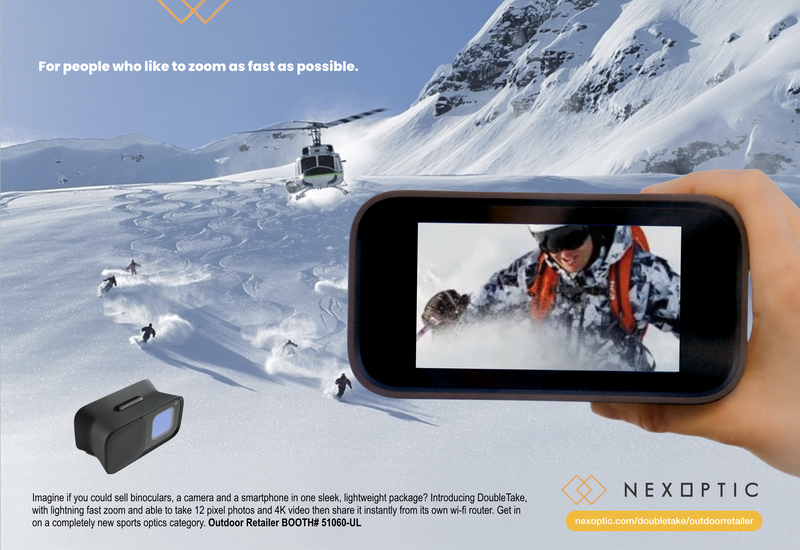 Mountain is receiving $2,500 per month from NexOptic Technology Corp to host this content, in addition to an advertising budget for ad purchasing and digital marketing. This compensation constitutes a conflict of interest as to our ability to remain objective in our communication regarding the profiled company. Because of this conflict, individuals are strongly encouraged to not use this newsletter as the basis for any investment decision. Don't Miss NexOptic's Next Update. Sign Up Here.